Beginning in the Rangeley Lakes, the Androscoggin River does not actually gain its name until it flows out of Lake Umbagog in New Hampshire. While the majority of its water’s come from the lakes through the Rapid River, it also receives water from the Magalloway River, which begins in the far northwest section of Maine and runs south, paralleling the New Hampshire line. The Androscoggin then enters New Hampshire, makes a wide arc and re-enters Maine at Gilead. Settlement along the Androscoggin River began in 1774, when Bethel was known as Sudbury, Canada. The surrounding river towns were settled in the next six or seven years. Upton, located on Lake Umbagog was settled in 1823, access being by way of the “Coos Trail” through Andover. Two years later the first families arrived in the remote townships along the Magalloway River. Sporting in this region did not begin until about the 1860’s when the railroad reached Bryant’s Pond and Bethel. A daily stagecoach left Bryant Pond for French’s Hotel in Andover and another left Bethel, stopping at the Poplar Inn on the Bear River, on its route through Grafton Notch to the Lake House at Upton. The earliest account we have of this region was by the noted historian Francis Parkman, who came over the mountains from New Hampshire and paddled down the Magalloway in 1842 and by a tourist from Cambridge, Mass., who had his account published in the New York Times in 1852 under the pseudonym “Quahog,” In 1860 an anonymous writer published his adventure in Harper’s Magazine and the following year Marshall Tidd, a lithographer from Woburn, Mass., travelled through Grafton Notch on his visit to Parmachenee, keeping a journal and sketching various scenes. In 1864 another anonymous account was published in Harper’s Magazine, further advertising the great fishing to be had in this region. Capt. 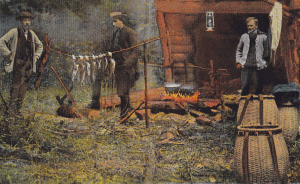 Fred Barker and John Danforth trapped in the Parmachenee region in 1876 and wrote about their adventures in Hunting and Trapping on the Upper Magalloway River and Parmachenee Lake. Only a few sporting camps were located in this section. Hotels in Upton served sportsmen on Umbagog Lake, Capt. Wilson took in travelers in Wilson’s Mills, and sportsmen could stay at Camp Caribou, John Danforth’s famous camps on an island in Parmachenee Lake. Camp Caribou’s most famous guest was President Eisenhower, who stayed there in the summer of 1955. Later sporting camps were Bosebuck Camps on Aziscohos Lake, Big Buck Camps on Sturtevant Pond, and Indian Rock Camps at Howard’s Pond in Hanover.